My name is Joon Park. As a Korean-American immigrant from suburban New Jersey, I hated my name growing up. I hated how foreign it sounded in a sea of Jacob’s and Emily’s. I hated how my teachers would insist on colonizing my name by calling me “John” instead. And more importantly, I hated how everyone always assumed that John would be a better nickname for me than something like Jane, even though both sounded equally similar to Joon. Fortunately–after a few tumultuous years of learning to live in my truth–I realized I love being Korean, and that I shouldn't be ashamed of my identity as a Korean American. I discovered that I loved introducing myself as "Joon, like the month" because I was also born in June. I loved how the two O's in between the J and the N looked like twins, just like the Gemini I am. (Yes, Gemini’s are the best, don’t @ me). More importantly, it was in the process of learning to celebrate my name that I also learned to celebrate my trans identity. Just like the term “LatinX” encompasses all the beautiful queer, gender non-binary identities within LatinX identity, I love how Joon so effortlessly marries my Korean identity with my trans and queer experience. And ever since I’ve learned to celebrate my Joon-ness in all its complex and beautiful parts, the world has become an easier place to exist in. Despite the evils that plague our world today, I remain grounded in my identity as a proud trans Korean-American: #ILoveBeingTransBc it is the one thing that the world cannot take away from me. Learning to love my name was how I started my journey of celebrating my trans identity. The #ILoveBeingTransBc campaign seeks to celebrate trans resiliency and bring positive visibility to the trans experience. 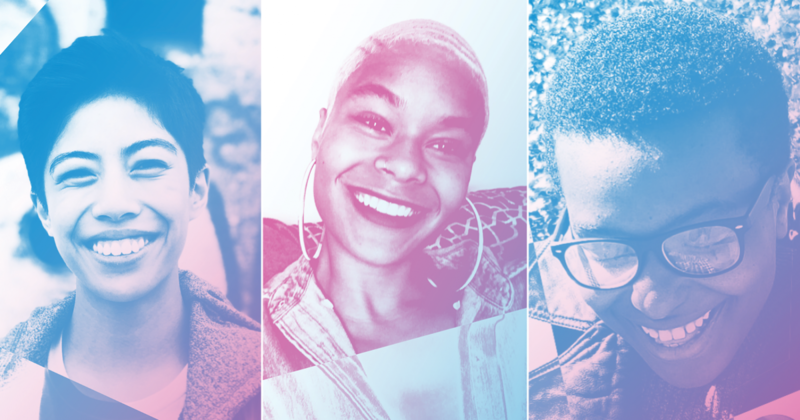 Learn how these 7 GLAAD Campus Ambassadors embarked on their own journeys of self-love and acceptance. I identify as gender non-binary and queer and I love being trans because it gives me the freedom to accurately label myself and live an authentic and happy life. I identify as a queer trans man, and my pronouns are he/him/his. I'm a first-generation Filipino-American. Being trans has made me resilient. The process of figuring out my identity and coming out was a long one, with a lot of meaning-searching. It's motivated me to become an activist, while giving me so many opportunities for self-growth and introspection. I identify as a blaqueer non-binary femme and I love being trans because it has given me the self-love and autonomy that I have always dreamed of. Coming out as non-binary has given me so much opportunities in my life to be who I am fully and love myself wholeheartedly, and to change the notions and definitions of what it is to be happy and trans. I identify as non-binary and I love being trans because being just gives another perspective or outlook on life and you’re not really a part of what the social “norm” is. It’s very special to me also because I’m way more comfortable in my skin and in my soul since coming out. I identify as a transgender man and I love being trans because this identity, through its ups and downs, has taught me to take better care of myself by seeking out community and support. It has made me more resilient and more aware of the way that society views and often misunderstands gender. And through many of my own experiences, my gender identity has taught me how to create more inclusive spaces and to advocate for both myself and those around me. I identify as agender and I love being trans because it gives me the space to be my most authentic self in a world that constantly perpetuates and forces falsehood. I identify on the non-binary spectrum, specifically as trans-masculine. I have loved my journey as a trans individual because it has introduced me to a family who loves and supports me. Joon Park is an amp Contributor and GLAAD Campus Ambassador Alum. They are a 2017 GLAAD Rising Stars Grant recipient and an ADCOLOR FUTURES program member. Joon graduted from Boston College with a degree in Economics in 2018. Follow them on Instagram @joonyoungpark.